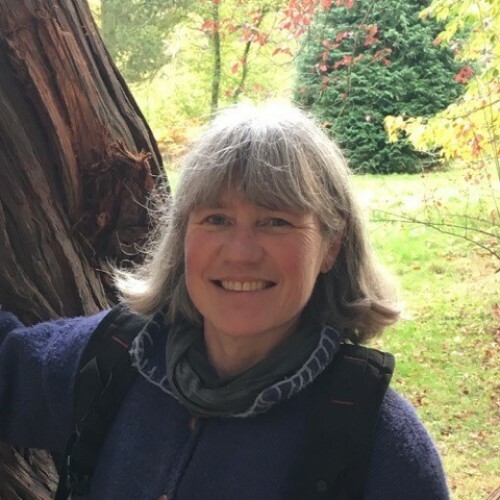 Mandy has been practising shamanism since 2007 and completed her Shamanic Practitioner training with the Sacred Trust in 2009. She lives on the edge of the ancient Forest of Dean in Gloucestershire, close to the Wye and Severn Rivers and the rich farmlands of Herefordshire and Monmouthshire. She revels in the diversity and directness of our natural environment, often being shown aspects of nature which are essential to her shamanic practise. She runs workshops on Eco Shamanism which is a new approach to shamanism, involving perception and perspective techniques designed to help us become one with our Earth. Until recently Mandy taught classical, jazz and contemporary to Grade 8 standard. In the 1990s Mandy set up and ran a small organic vegetable garden selling the produce through one of the first vegetable box schemes. She wrote a book on the subject entitled ‘Valuable Vegetables’ and also spent several years teaching courses on sustainable gardening privately and at a local further education college.